Okay so with back to school I will try to get back into the swing of things! 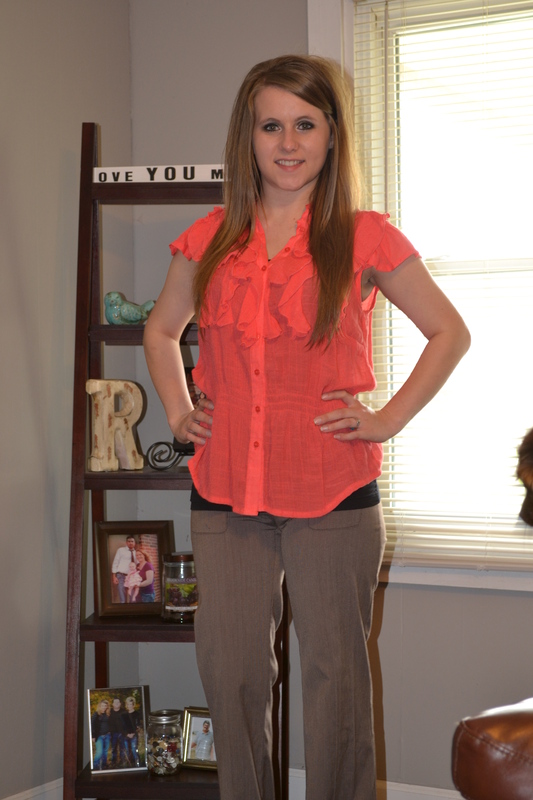 So here goes another round of Frugal Fashion Friday!! My daughter started working at a local bank, so she needed some dressier clothing. She went and bought a pair of dress pants (for like $30) but still needed more. Leave it to cheap-o mom to the rescue!! We took a hundred bucks and came home with tons of great “new” clothing! She loves thrift shopping as much as her momma!! Here we have this adorable outfit- total cost? A whopping $5.50! She found this top at Goodwill for $3.50, what a deal! But wait- those super awesome pants were a find at Salvation Army and they were half price to boot (normally $4, sale $2). I will share more of our shopping trips in the weeks to come! We are just a frugal, thrift loving family!! I hope all are having a marvelous week, I know I am! My baby boy turns 17 today, wow! I am truly a very blessed lady and I give all the glory to God! He blesses me much more than I ever deserve and I thank Him daily for it. Have a wonderful weekend- God Bless!! Thankful for Life-Long Friends, Shopping Trips and Food! I have on my mind going to the Goodwill there, because in the past I have scored some great stuff there. There are also a few good “junk” stores, which I would love to hit today, also. I am getting excited about Christmas, but I know better than to start shopping too early- I end up overbuying when I try to. I wait until closer, so when I say we’re done- I won’t be tempted to go buy more. So having a great friend like mine is great, she and I don’t talk a lot, or see each other but a handful of times a year, but when we get together, we are those chatty junior high girls again, if just for a while. When our kids were younger we got together with the kids. Then as they’ve gotten older, we decided it was all about us. So we meet up and spend the day being a little selfish, although we both end up picking up stuff for our sweet kids before the day is up. It is a nice feeling that we still connect after all these years. In life, we all need those connections, and when we find them, we have to hold on to them. Family is not always about being blood related, Diana is my sister, through and through. Okay so off to find something to wear!! I hope all have a Blessed day! Write one of your good friends a text, or better yet- drop them an old-fashioned card in the mail, I still love getting mail!! God Bless!! NO tricks here- just finding great deals that look fabulous! The weather here has been on the warm side, but expecting a cool down starting today. I am ready to be able to wear some of my cute fall clothes without burning up. The temps have been around the mid-eighties here, not exactly boot and sweater weather! I have some of my $7 jeans (which by the way are Hydraulic- which I hear is a pretty good name brand?) paired with a cute striped lightweight sweater (Coldwater Creek brand). This sweater still had the tag marked $69.99, which I about died when I saw, who in the world would ever pay that? I paid $3.50 at the local Goodwill instead. To finish off this look I am once again wearing my trusty brown boots from walmart, they were around 30 bucks last year. 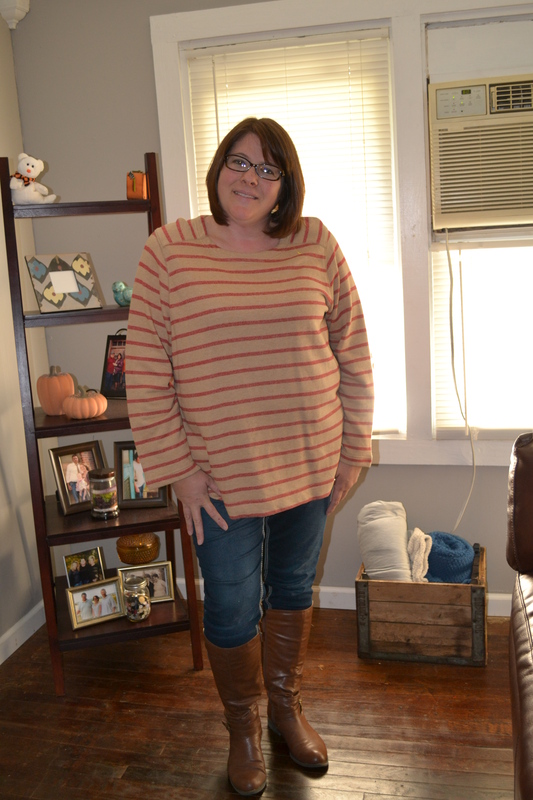 So for a total for this cool weather look is a whopping $40, including the boots. Yeah! So go forth and put your best self forward, just don’t pay too much to make said self look fabulous! I am ready for some Friday night football with my favorite team, our local Bearkatz!! Hope all have a wonderful weekend filled with loved ones. It’s fall- enjoy this beautiful time of year God has given us! God Bless! Okay so here we are for Frugal Fashion this week. This week I am showing a dress I found earlier in the summer for $4. It was originally from the Dress Barn and was probably quite expensive. I bought it for the 4th of July week, since it was red, navy, and cream colored. 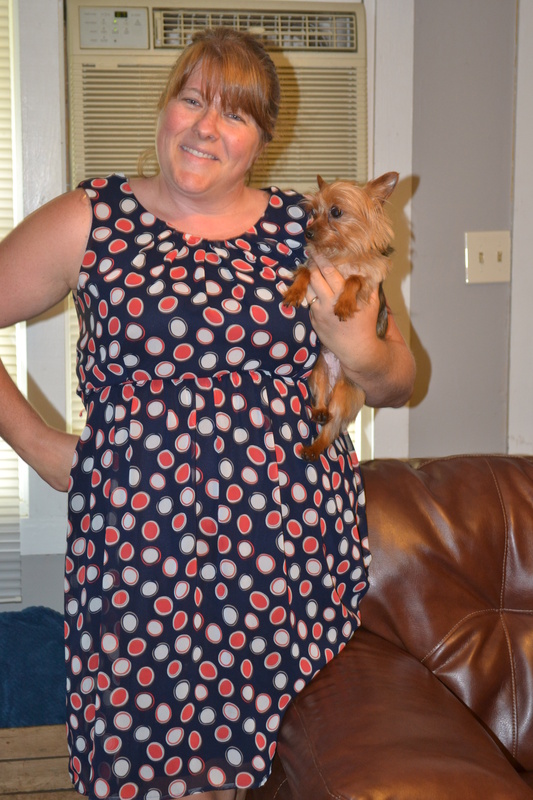 My little yorkie Fiona was excited to be part of my frugal fashion this week. My daughter is my wonderful photographer, and I am thankful to have her help. I just love finding great deals and sharing them with you. I also love that I spend a fraction on my clothing and still look good (I think, anyways). It is also a blessing to see my children look for bargains and shop frugally. Knowing that I have instilled in them a desire to save money is a great feeling. I would love to hear ways you are content with less. Thanks for visiting my little corner of the world and have a Blessed week!! Because a home without a dog is just incomplete! Learn about the thrill of thrifting!